This is a sight I have seen in real life. Our family owns a Great Dane. Her name is Maggie and her nose is counter height even when she is on all fours. No counter or tabletop is safe in this house! Countless dinners and snacks have gone 'missing' with this gentle giant as a pet! When is saw On the Table stamps I was in love! For this card, I started by stamping the two cupcakes and creates masks for each. Then I stamped to plate of cookies masked it and then stamped the puppy dog and masked her, too. I masked off below the images and then stamped the stripe background stamps. I then colored the images with Copic markers and finished drawing the table top on each side of the cupcakes. I used my lightest color markers to create a glow and a bit of a shadow behind the scene. I used colored pencils to add a little bit more detail to my coloring! 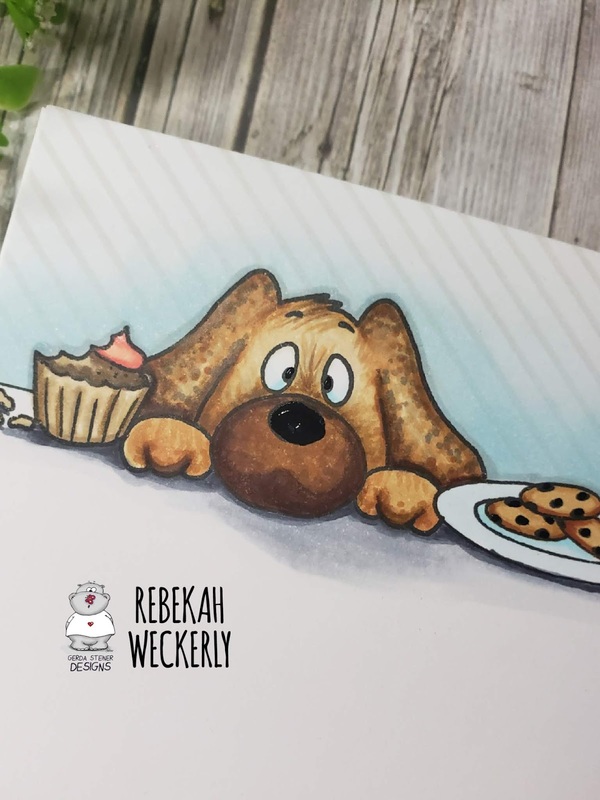 Thanks for checking out my card! Now, get stamping!